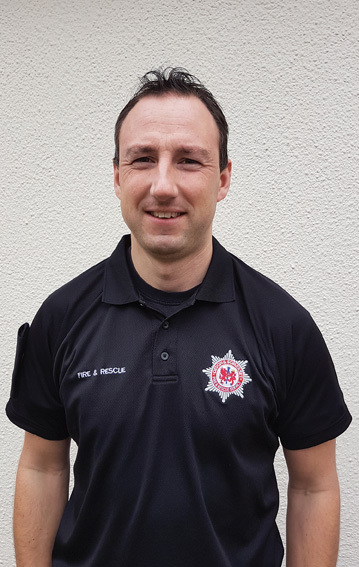 As Watch Manager of Devon and Somerset Fire and Rescue Service, Jason Hill gives an insight to his job by describing himself with a smile as, “the one with the white helmet, think of Fireman Sam, I get to sit in the front seat!” For nearly a year now, Jason has been running Red Watch at Exeter City Centre Fire Station, a great accolade. Working shifts of two days and two nights before four days off, there is no standard work day for this full-time firefighter. Jason is always busy. There is kit to clean and examine, and then check again. Every bit of equipment gets inspected twice a day, every day. Fire Safety Inspections need to be carried out at local businesses, as well as Operational Risk Visits at public sites. No matter where they are though, if the alert sounds, the team have to be back in the fire engine and moving down the road within 60 seconds. Some of the most common calls they deal with are supporting other services, such as the Ambulance service or Police. Jason admits ‘the job can be harrowing at times, but saving someone’s life is the most satisfying thing you can do’. And of course, for anyone in charge, there is desk work too. Jason writes the incident report for the call outs and carries the responsibility of ensuring all is in order at the station. Jason is the son of a fireman, his dad has inspirationally been in the service for 40 years. Jason grew up on a dairy farm in Colyton, but always knew he also wanted to follow in his father’s footsteps, so joined as a retained fireman at Axminster. He has now served 16 years as a fireman, with over 14 years full time. Living in Chardstock with his wife Emily and dog Rudi, the couple are busy renovating a bungalow they bought, which takes up Jason’s time when he’s not on shift. He also finds running therapeutic, something that clears his head, paired with fitness being a part of the job. He still loves the rural countryside and gets involved in the local community as a bell ringer at Chardstock Church. A fan of the Exeter Chiefs, who he tries to see as much as possible, you may also catch Jason on his downtime, with a well-deserved beer in hand, watching Formula One.